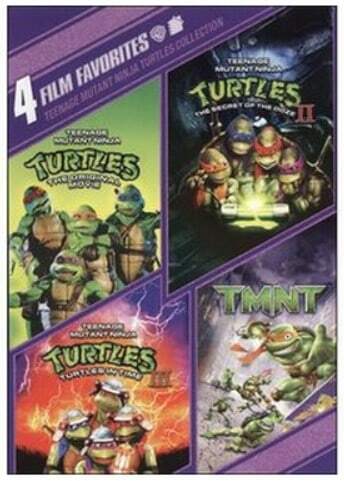 The Teenage Mutant Ninja Turtles Collection: 4 Film Favorites is on sale for $9.99 at Walmart.com right now. That's 34% off the regular price of $14.99! The TMNT are back and as popular as ever. If you have a fan in your house be sure to grab this great deal! After wading in a puddle of radioactive waste, these radical reptiles are transformed into New York City's greatest crime-fighting quartet. The “Teenage Mutant Ninja Turtles Film Collection” includes “Teenage Mutant Ninja Turtles: The Movie”, “Teenage Mutant Ninja Turtles II: The Secret Of The Ooze”, “Teenage Mutant Ninja Turtles III: Turtles In Time”, and “TMNT”. “Teenage Mutant Ninja Turtles: The Movie” is the live-action, feature film adaptation of the cult comic book and the popular animated television show.